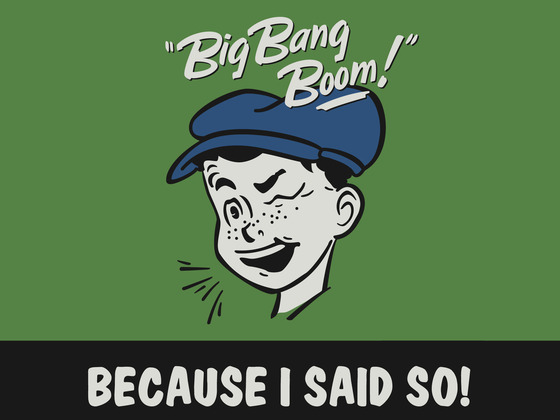 Check This Out: Big Bang Boom: Because I Said So! Because I Said So!, the third release from North Carolina’s Big Bang Boom, is a real family jam party. This high energy album is packed with a dynamic blend of styles from good ole rock n’ roll to hip hop and even a bit of funk. Big Bang Boom is made up of a trio of Dads, including Steve Williard, Eddie Walker and Chuck Folds, brother of Ben Folds (yep, as in Ben Folds Five). Because I Said So! feels like an introduction to college rock for tots. But make no mistake, the music is meant to appeal to a broad range of ages, including adults. And it certainly does! I can’t help but reminisce on my college days while listening to their catchy choruses and thought-provoking verses. Because I Said So! delivers an enjoyable bunch of songs that address the deeper meaning of parent-child relationships and family dynamics. As fathers themselves, these guys write thoughtful lyrics based on their own experiences, as opposed to writing generic songs that simply fit the mold of being a band that makes music for kids. Their songs put the role of “kid” front and center, and it is that “kid” who sings about and responds to interactions with his or her parents. The scenarios are so relatable, it’s uncanny. There are several Seinfeld moments where I laugh out loud while listening to real-life scenarios throughout the album. Although, I can’t help but feel as though I am being taught a lesson, as well. Not in a preachy way, but in a way that makes me think more about how my own daughter experiences life through her little eyes and ears. One of our favorite songs, “Make Me,” appeals to the idea that kids make mistakes but also seek to understand why there are rules and consequences. The song is so upbeat and catchy that you can’t help but get excited when you hear it. You can view the video below, as well as read my earlier post here. The growling intro to “Are We There Yet?” very accurately expresses the frustration often felt on car trips. The call and response style, mixed-in with a little cowbell, feels similar to a Beastie Boys song. “Because I Said So!,” the album’s title track, sounds like a mix between the Ramones and Blink-182 with its pop-punk makeup. The tone of the song accurately matches the discontented feeling a blanket answer like “because I said so” might feel to a kid. The album also aims to educate with songs like “Green Light,” which lays out the rules of the road in a really fun and easy way. I have always found yellow to be a more difficult color to explain. However, this song ties it all together with the short and sweet catchphrase, “yellow means slow.” In fact, it’s so easy to convey that when my little backseat driver calls out “Mom, you are supposed to stop at yellow!” I am almost too pleased to remind her about this song and then ask, “What does yellow mean?” which is always answered with “Yellow means slow!” Of course, at the mercy of my own guilt, I still find myself launching into a wordy explanation, which almost always results in the snarky retort “Mom, I can’t hear the music.” Ah, parenting…. Other notable songs include, “The Counting Song,” a quick-paced rap which makes a game out of simple math (addition, subtraction) by using your fingers. “Put one finger up that’s all you gotta do/add another finger to the one and that’ll make 2/ take the one away from 2 it’ll leave you just 1 …grab yourself a friend plus you makes 2/ add the 1 and 1 that’s all you gotta do. ….so we added two fingers and we added two friends/added more and more so the counting never ends…” The call and response portions of the song carry a bit of a Sesame Street vibe as the chorus of kids echo back numbers as they are called out. “Control” offers a bit of advice on impulse control and sibling rivalry while “One” encourages goodwill and a giving heart. The album ends with “Goodbye,” a sweet little song with some humorous reminders mixed in. Because I Said So! contains 11 tracks with a runtime of 27 minutes which is nice for the shorter attention spans of the younger bunch while leaving the older bunch eager to put the album on repeat. Em and I dig the sounds blasting out of our speakers and we think you will too. Recommended for all ages and then some! You can listen to samples of the entire album here. The album can be downloaded and purchased through Amazon, iTunes and CDBaby. Full Disclosure: I was provided with a copy for possible review. All opinions and thoughts expressed here are my own.